Dear Neighbors, I have good news! The Eliot Neighborhood Association Board of 2018 has already proven to have ambition, and the energy and dedication to back it up. We have been dreaming big — challenging ourselves to be more visible in the community, and to make change where we can. 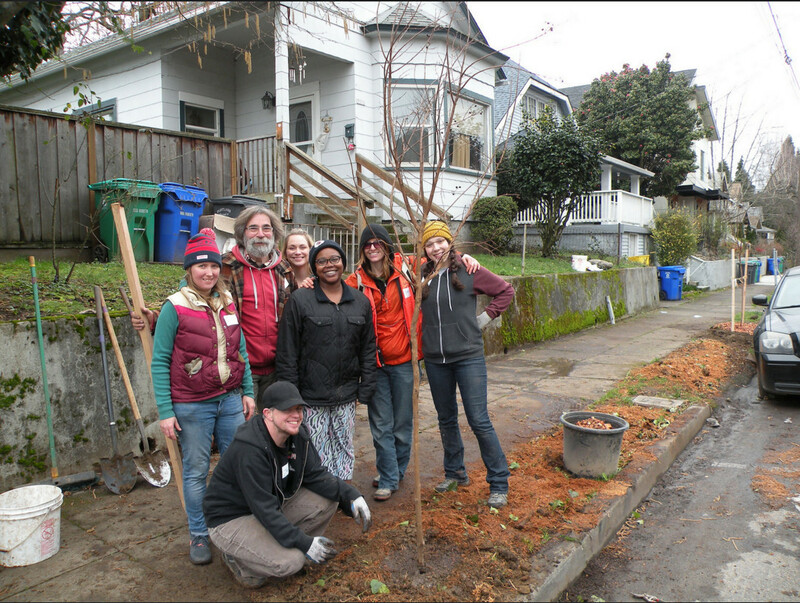 The Albina Neighborhood Tree Team, started in 2014, has just received the 2016 Bill Naito Community Trees Award from the Portland Urban Forestry Commission. The commission “recognizes groups and individuals for their stewardship, advocacy and commitment to trees in Portland.” ANTT has received this award for their “exemplary actions and achievements as a group” working in this endeavor. Did you plant new trees this past fall or spring? Good job! Now, make sure they get watered. As you have probably noticed it has been an unusually dry spring. It has been great for people and outdoor activities, however not so great for thirsty young trees. Trees that were planted recently need water and Mother Nature is just not helping this year. Continue reading Water Your New Trees! 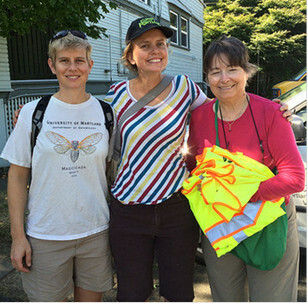 Eliot and Boise neighborhoods were among the 12 neighborhoods where Portland’s Urban Forestry Dept organized citizen teams to inventory during the spring and summer of 2014. 17 neighborhoods and 70,000 trees have been inventoried since the project began in 2010. Tree by Tree, Block by Block: Join volunteers to inventory every street tree in Boise and Eliot. This summer, dozens of tree lovers will explore the Boise and Eliot neighborhoods on a mission to identify, map, measure, and assess the condition of every street tree. This inventory is the first and most comprehensive street tree inventory ever performed in our neighborhoods. The project is being organized by Boise and Eliot Tree Team, a group of neighbors committed to improving their urban forest. A partnership with Portland Parks & Recreation, the inventory is the first step in expanding, diversifying, and protecting trees in the Boise and Eliot neighborhoods. 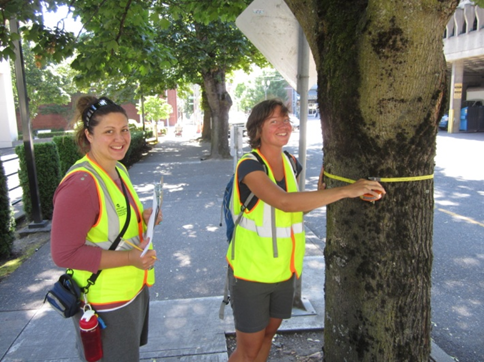 For the past four years, Portland Parks and Recreation (PP&R) has sponsored street tree inventories in neighborhoods across Portland as a way to assess the condition of the urban forest and build community around this shared resource. Thus far, the project has collected information about the location, species, health, and size of nearly 70,000 trees in 17 neighborhoods. 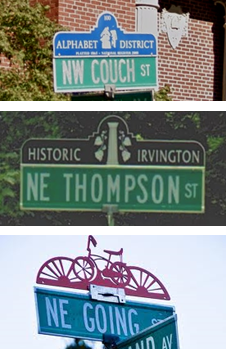 The Beauty and Livability Committee was formed in 2012 to implement the Neighborhood Livability Partnership. This one-of-a-kind Partnership between the Lloyd Community Association, Eliot neighborhood, and the Portland Arena Management (Trail Blazers) is a unique opportunity for political support, collaboration and physical investments. The focus of improvement is the area between Weidler and Russell from south to north and between NE 7th to the river, an area plagued by sports-related traffic and parking issues. In April of 2013, the Eliot Board of Directors voted to accept funding from the Neighborhood Livability Partnership for two projects. 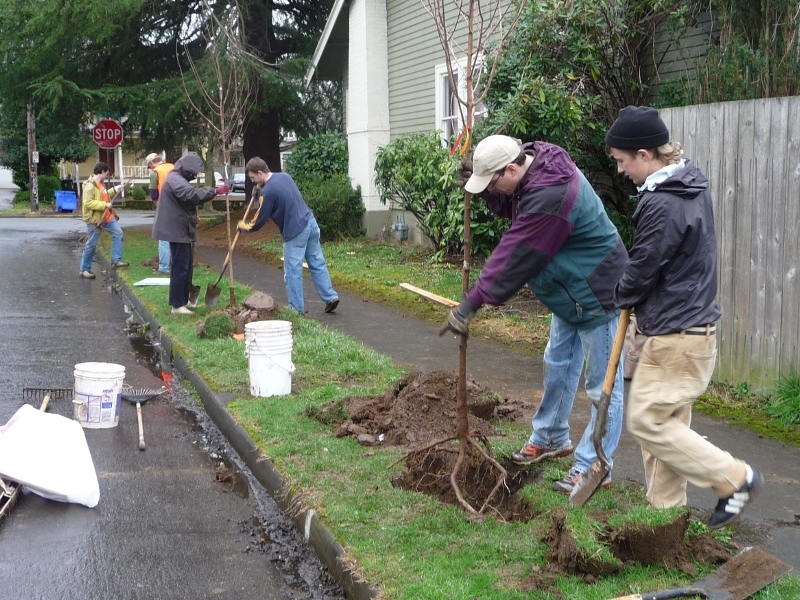 The Board approved the funds for planting 14 street trees and the Intersection Repair, a painting on Tillamook and Rodney Avenue, completed by over 50 volunteers who designed and completed the project in June 2013. Unused funding from 2013 will roll forward since the funding from the Trail Blazers offers three-consecutive years at $5,000 per year for improvements. The Beauty team is hoping that they will be able to partner with landowners for matching funds to implement larger projects. 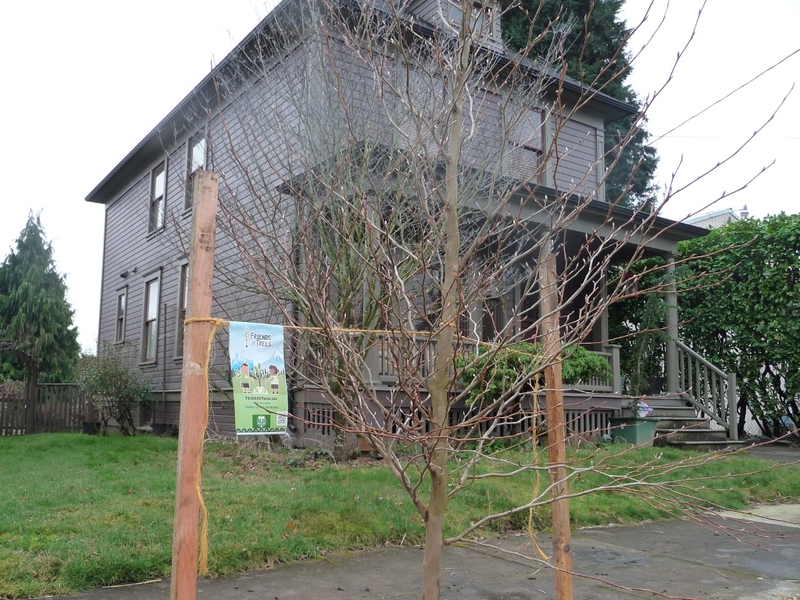 The Albina Tree Initiative aims to plant 140 street trees in Eliot, Boise and Humboldt neighborhoods. 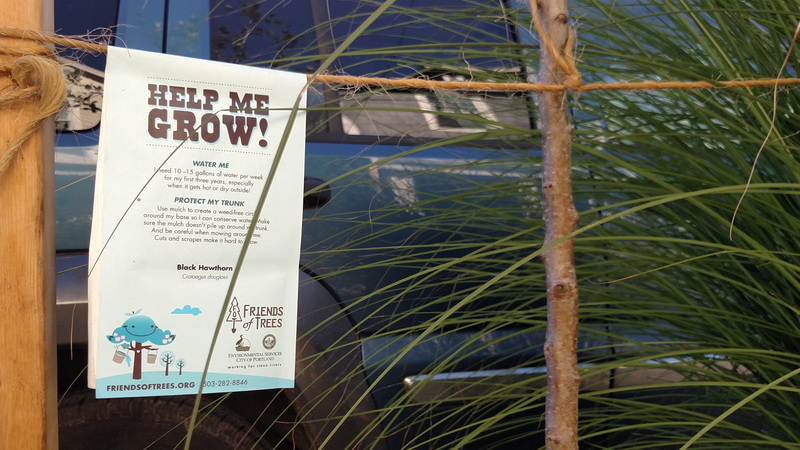 Using money from 2 different grants, Rosemary Anderson High School Students in partnership with Friends of Trees will be planting the trees in February. On Saturday February 11th Eliot neighborhood turned a little less gray and little more greener. New trees were planted in the neighborhood at the annual Friend of Trees neighborhood planting. 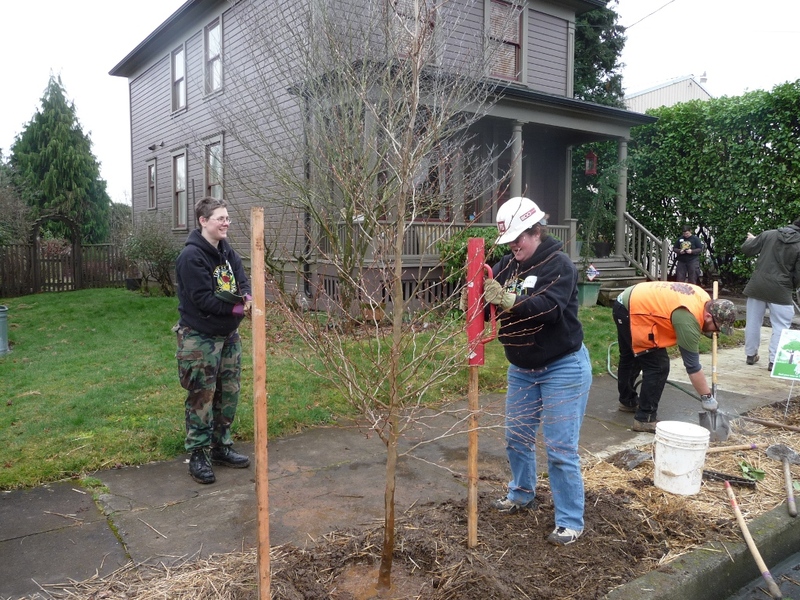 As has been tradition the last few years, Eliot joined Boise, Humboldt and King to plant tress in North and Northeast Portland. The Eliot Neighborhood Friends of Trees planting will be on Saturday February 11th. Volunteers are needed to help make this planting a success. It’s a great way to get to know your neighbors and help improve the neighborhood. In partnership with Friends of Trees, Eliot Neighborhood is planning another tree planting event this winter. Join us Saturday February 11th to help plant trees and create a healthier community! Friends of Trees is turning Portland grey to green by planting thousands of trees all over the city. Find out if one has your name on it. Buy a discounted tree for your planting strip or yard. Become a volunteer. Or simply make a donation. In partnership with Friends of Trees, Eliot Neighborhood is planning another tree planting project this winter. Join us Saturday February 12th to help plant trees and create a healthier community! Numerous new acquaintances and friendships made. 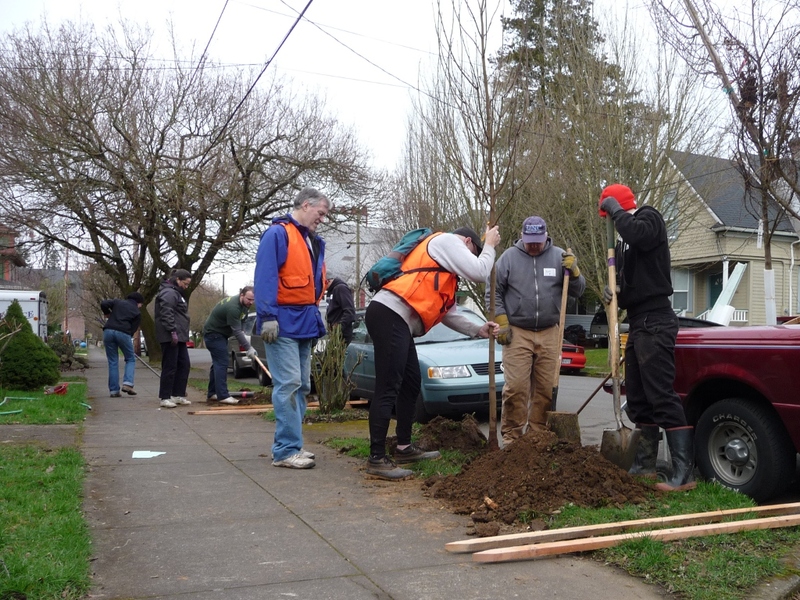 It’s the annual Friends of Trees (FoT) Planting in NE Portland! The event commenced Saturday morning February 13th. The day began rather dreary but as my husband rallied the crowd to a chant of “It never rains on planting day!” the drizzle stopped for a few hours while about a hundred people came together to help plant trees. The Eliot Neighborhood Friends of Trees planting will be on Saturday February 13th. Volunteers are needed to help make this planting a success. It’s a great way to get to know your neighbors and help improve the neighborhood.